Glamorgan have signed Australian Test batsman Marnus Labuschagne as their overseas player for the first half of the 2019 season. Labuschagne arrives in Wales on Wednesday, 3 April as cover for Shaun Marsh. The 24-year-old will play in around eight Championship games, starting against Northamptonshire on 11 April. Labuschagne will also play in the whole of the club's Royal London One-Day Cup 50-over campaign. The South African-born batsman broke into the Australian Test team with his debut against Pakistan in October 2018 and is a contender for the Ashes series in England later this summer. "It always helps playing in the (UK) conditions and on the wickets, and it is an Ashes year," said Labuschagne of his chances. "But even if it wasn't, I would have taken up the opportunity because I really love watching (UK) county cricket in our winter, and both times I've been over (as a teenager) I've loved it." He told BBC Sport Wales that playing on a green, bowler-friendly wicket in Brisbane should improve his chances of adapting quickly to Cardiff in April. "You challenge yourself on that wicket, at least I've come from a place where you play on tough wickets consistently. In April it's not about scoring pretty runs, it's about scoring ugly runs, being effective and finding a way to put your team in a winning position." Marsh is highly likely to feature in the World Cup until July, and will return to Glamorgan then if he is not required for Australia's Ashes series against England. Labuschagne moved with his family from South Africa to Australia aged 10 and came through the Queensland academy structure, making his first-class debut for the state in 2014. He has scored four first-class centuries with a career-best of 134 and has taken 28 wickets with his leg-spin, also averaging over 38 in List A (one-day) cricket. "He's a top three or four batsman in both four-day and one-day cricket so he'll give us some stability. But he's also been 'player of the year' in their List A competition so he can play in both gears, and we're lucky to have him," said Glamorgan director of cricket Mark Wallace. 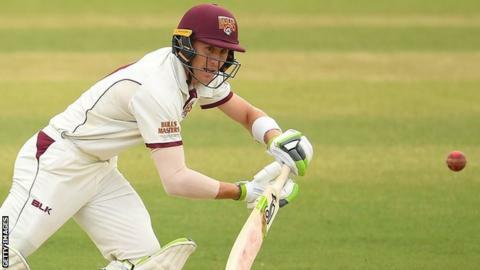 He is the fourth Queensland player to sign for Glamorgan in two seasons, alongside English-born Charlie Hemphrey and 2018 batsmen Usman Khawaja and Joe Burns. He already knows Glamorgan opening batsman Nick Selman from the Queensland youth system.